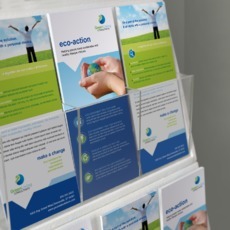 Rack cards are simple and affordable tools in advertising. They're efficient when it comes to informing the public about your business’ products and services. The challenge of using rack cards is that you have to design it an attractive way to make your target audience pick up your prints from a rack. The strength of these cards in advertising lies on its appearance - especially on its design. An important factor that needs attention is its dimension. There are 2 rack card sizes that are widely used and are available here in UPrinting. 3.5” x 8.5” and 4” x 9”. Both of this size comes with wide array of options such as paper type, perforation, printed side and more. There is a slight difference between the two and it’s up to you to choose what you want to incorporate on making your cards. It will all depend on how you utilize the spaces on your cards. Mix and match with our custom options. Choose what best fits your business’ products and services. Give us a call at 1-888-888-4211 for questions, queries, or orders! We are happy to assist you on your printing needs.